Skälsö Arkitekter was founded in 2010 by Joachim Kuylenstierna with the purpose of developing the peninsula Bungenäs in the north of Gotland. Since then the office´s main work has been to continue developing the area through the restoration of existing buildings and development of around 20 newly built holiday homes amongst them the transformation of five existing military bunkers. In 2017 Skälsö Arkitekter was awarded “Villapriset” (best villa of the year-award) by the Swedish Architects Association, “Ung Svensk Arkitektur” (best young office-award) by the swedish magazine ”Arkitektur” as well as Residence Magazine´s “Stora Formpris” (great form prize – Swedish Architect of the year-award). Year 2018 was Skälsö Arkitekter, together with 72 other the international architecture offices, invited by the curators Grafton Architects to participate in the international exhibition at the Architecture Biennale in Venice. To the exhibition, with the theme “freespace”, Skälsö brought eight concrete cut-outs from realized Bunker projects on Bungenäs. On top of the concrete fundaments, architecture models, drawings and photographs of different built projects were displayed. Skälsö Arkitekter are nominated to the prestigious Mies van der Rohe award for the Bungenäs-project. It is now time for Skälsö Arkitekter to move on. 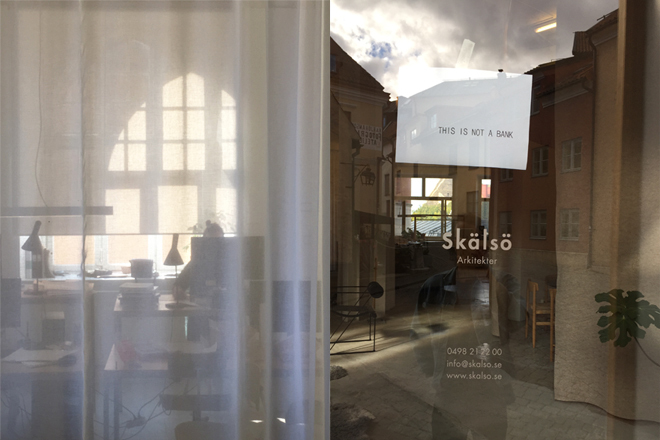 On February the 1st Skälsö Arkitekter will cease our activities as an office. All of us will continue to work with architecture but in new ways and in new places. Skälsö Arkitekter will still keep its role as head of the design-committee on Bungenäs.